From construction and materials to everyday energy use, homes can have a significant impact on the environment. 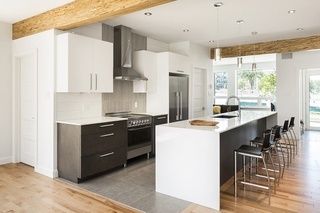 Increasingly, homeowners are opting for features that help reduce their ecological footprint. 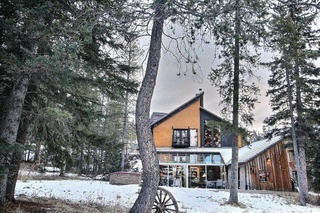 These five eco-friendly properties across Canada prove that you can find a home as sustainable as it is beautiful. 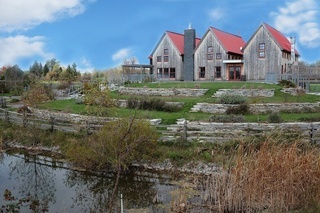 In Prince Edward County in Ontario is Cherryvale Farm. Spanning 146 acres, the property has the potential for a variety of uses, including a hobby farm, vineyard, relaxing corporate retreat, and impressive family compound. Comprising elegantly crafted residences, a farm centre, an energy-efficient greenhouse, and more, this property embraces its natural surroundings and has sustainability at its core. Windmills and solar panels are integrated into this master plan, while the property has also earned organic farming awards. 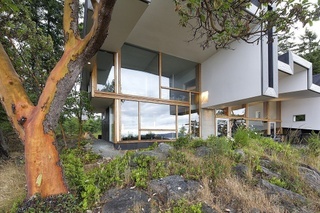 Located in the Southern Gulf Islands of British Columbia, Ridge House is an architectural gem. Designed by Marko Simcic and Brian Broster, vast scenic outdoor views take centre stage in this contemporary home. Set on a sun-soaked ridge, the exterior’s shapes are cutting-edge while the interior remains bright and inviting. Built with the careful application of methods and materials, Ridge House’s environmentally mindful design provides thermal balance and a stunning modern aesthetic. Roughly an hour away from Calgary is a mountain retreat in Canmore. The timber-frame home embraces its alpine surroundings, using local natural materials in its construction. Modern rooflines and views of the outdoors are key elements in this peaceful abode. Green features of the home include straw bale insulation and a living green roof. The combination of this property’s contemporary and environmental design makes this a standout. About an hour away from Montreal is a PolygHome in Saint-Hippolyte. Sky-high windows create a dramatic exterior and the impression of living in the forest. Its architectural excellence is matched with environmentally-friendly design: this bioclimatic home makes use of recovered engineered wood for beams and is certified by the Forest Stewardship Council, an international organization that promotes responsible management of the world’s forests. La Cité Verte (Green City) is the first multi-residential project in the field of green and intelligent building in Quebec. The project has been recognized for providing solutions to environmental issues such as urban densification, rainwater management, energy efficiency, preservation of green spaces, and more. La Cité Verte properties include condominiums and townhomes, including this stunning corner townhouse unit featuring wood beams and bright, open spaces. Which is your eco-friendly dream home? Homeowners are becoming more mindful of the impact their homes have on the environment. All of these featured homes share a variety of sustainable features, without sacrificing their own unique and beautiful architectural elements. 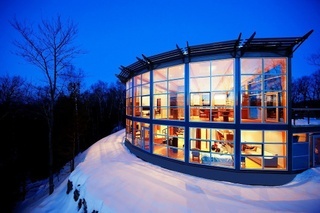 Which eco-friendly residence would you call your dream home?